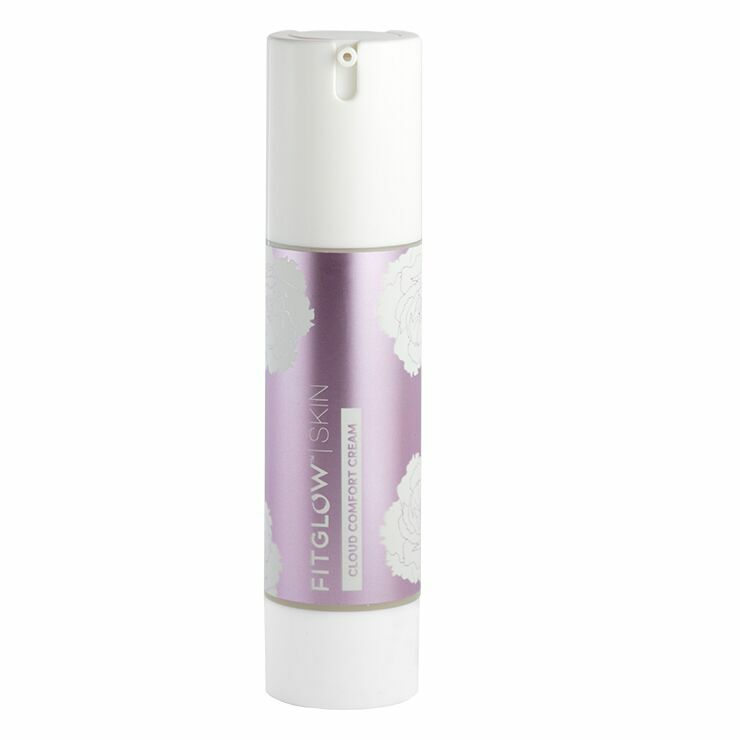 Give a restored and strengthened feel to skin with Fitglow Beauty Cloud Comfort Cream (C3), designed for stressed, irritated, redness-prone skin. Organic Cloudberry makes skin feel deeply hydrated, while reducing the appearance of irritation and redness. Arnica soothes feelings of inflammation and irritation, while Chia Extracts lend a protective quality against environmental stressors. Skin is left looking calm, balanced, and renewed. Cloud comfort cream is recommended for those with skin irritations and rosacea. Massage cloudberry face cream onto clean skin or over serum. Use daily to reduce signs of redness and inflammation, and diminish the appearance of rosacea or irritable skin conditions. Very lightweight, smooth, light scent, goes on easily, absorbs quickly. This cream is not moisturizing enough for me. It works fine as a top layer over a good serum or face oil, but it is not enough alone. Within two hours of applying, my skin is dry. I have dry, mature skin and it craves hydration. I found that this cream felt lovely going on and didn't irritate my skin. It feels like enough moisture for daytime use for normal or combo skin. For me, I needed just a bit more. surprised to be in love! When i first received this product i thought it would be way too rich for my reactive, acne prone skin. It has done quite the opposite! It hydrates so amazingly and hasn't caused any new breakouts. The texture of my skin has definitely improved since I started using this product. I'll keep on with it! The brand name is kinda strange but as for the packaging to be honest i really love having a pump. I find a lot of serums and oils to spill over or break super easily (i'll admit i'm clumsy) and i like this no-mess solution. I have extremely reactive skin with rosacea. I quit the prescription antibiotic cream a year ago (it just wasn't working), and I have spent hundreds of dollars trying to find something to help my skin. This cream works for me. After using 1 pump twice a day for a month, I can see visible improvement in the redness and much less reactivity. The scent isn't too strong for me, and I can't tolerate many scents. After trying several products with lots of oils and extremely heavy scents, this one has a light scent that fades almost immediately. Unfortunately the sidekick caused my skin to be more reactive. I'm happy though. Finally something that is helping.